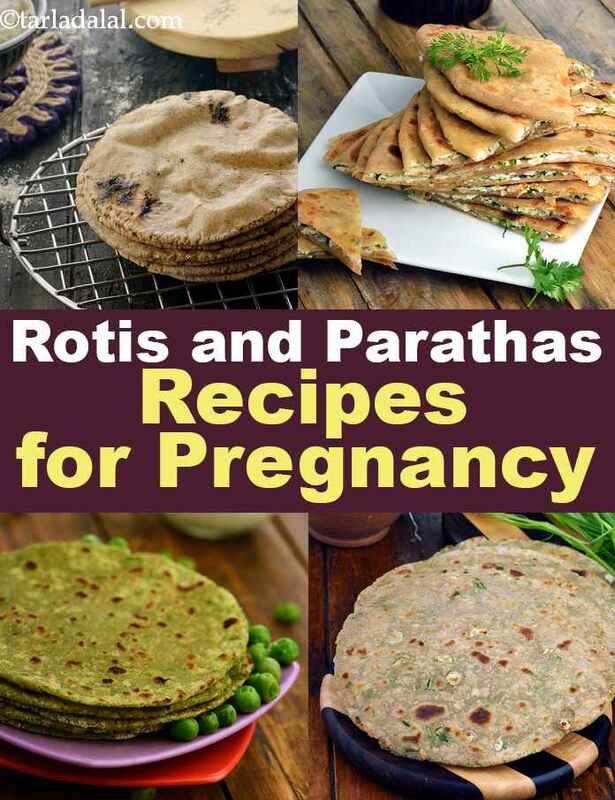 pregnancy rotis and paratha recipes. Rotis and parathas and flat Indian bread which are cooked in every households as a daily fare. They are either plain, or stuffed with a variety of ingredients to make them more satiating and appetizing. They are enjoyed for lunch or dinner, but in North India they form a part of traditional breakfast as well. While wheat flour is the most common flour used to make rotis and parathas, we have explored making them using a variety of flours like jowar flour, bajra flour, oats etc. to craft recipes. On days that you want to try making a healthy stuffed paratha, turn to add Paneer to gain in some calcium and protein which is of course required during the entire nine months of gestation. Toasted Roti is an imaginative way to turn plain left-over chapatis into a colourful and flavourful delicacy for a satiating breakfast. Moreover, you can prepare such roti’s using combination of vegetables that you like. Use a variety of flours to make your roti’s more healthful just like Multigrain Garlic Roti, the garlic in it will not only aid in digestion but also stimulates the production of breast milk, so turn to these rotis in the last month of pregnancy or while lactating. If you’re bored of the same old wheat flour rotis and want to have something new then try making these Jowar Rotis which are easy to make and uses minimal ingredients. A perfectly traditional and homely roti that is both satiating and incredibly tasty. It is very filling and makes a wonderful meal when served with kadhis, dals or subzis. You will go gaga over these scrumptious Paneer Parathas, which are stuffed with soft grated paneer and crunchy cabbage. This paratha is loaded with fibre, protein, thiamine, calcium and phosphorus all of which are necessary during pregnancy. Lazeez Paratha uses a combination of bengal gram dal (pulse) and broken wheat (cereal) and forms a complete source of protein and also provides fibre. Apart from being rich in nutrients, these parathas are also rich in taste and flavour. Green Pea Parathas are sustaining and wholesome. Puréed green peas are combined with whole wheat flour to make this delicious paratha dough. Both whole wheat flour and green peas are rich in fibre which aids in relieving from constipation as it is common during pregnancy. There’s no better nourishing meal than serving these rotis / parathas with a nice vegetable gravy or a bowl of Curd. While some prefer pickles as an accompaniment too, but we would not recommend it can cause heart burn, acidity or aggravate already existing high blood pressure or swollen feet if any. Enjoy all our rotis and parathas recipes for pregnancy. Explore more varieties in our pregnancy section everyday. Paneer paratha, paratha envelopes filled with lentils and cottage cheese. Combine this paratha with curds or raita to make a complete protein-rich meal.